The main entrance to Guy's Hospital is located off Great Maze Pond. Please use the postcode SE1 9RT. Guy's Hospital is located in the Congestion Charge zone. Parking is very limited for Guy's Hospital. Please use public transport whenever possible. 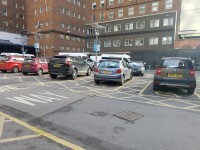 Parking in Guy's car park is only available for disabled patients on Monday - Friday between the hours of 8:30 and 16:40. 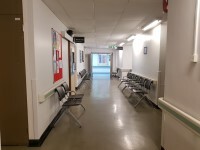 Please allow plenty of time to get from the bus stop to the hospital, as the hospital is not signposted from the bus stop locations. The following buses stop at London Bridge, London Bridge Station or near Guy's Hospital: 17, 21, 35, 40, 43, 47, 48, 133, 141, 149, 343, 381, 521, 701, RV1, C10. Night buses stop at or near London Bridge: N21, N35, N47, N133, N343 and N381. London Bridge is the nearest railway station and is five minutes walk away. The nearest underground stations are: London Bridge - Northern and Jubilee lines (five minutes walk away). Monument - District and Circle lines (15 minutes walk away). 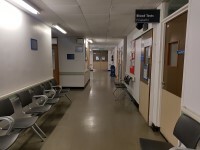 The Patient Advice and Liaison Service (PALS) is located on the ground floor in the main foyer. Volunteers can be found around the hospital at information points. Mobility aids are available to help patients move around and include; wheelchairs, walking frames, walking sticks and crutches. 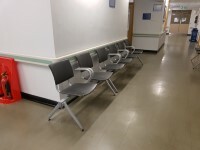 To obtain mobility aids please contact the main reception. The car park is located outside the main entrance. 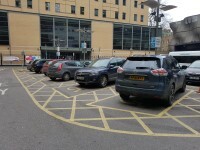 There is/are 15 designated Blue Badge parking bay(s) within the hospital car park. 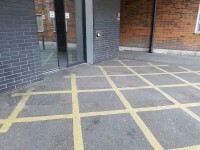 The dimensions of the designated Blue Badge parking bay(s) surveyed are 367cm x 756cm (12ft x 24ft 10in). The drop-off point is located to the right of the main entrance. There are not parking charges for the hospital car park. Payment signs are not provided. Payment signs are not clearly presented. The nearest designated Blue Badge parking bay is approximately 24m (26yd 9in) from the accessible entrance. 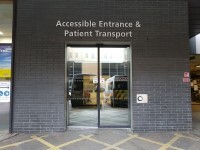 Between Monday-Friday, 8.30am-4.30pm, there is disabled parking only at Guy's Hospital. Vehicles can only access the car park from Snowsfield and not from St Thomas Street. This is for patients who are Blue Badge holders and have an appointment on that day. 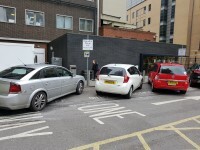 These disabled parking bays are limited and are available on a first come, first served basis on production of your Blue Badge (registered in your name) along with your appointment card/letter. There is an NCP car park at the junction of Snowsfield and Kipling Street, about a five minute walk from the hospital. Charges are displayed at the entrance. You are on Getting To (Blood Tests). Skip to the next section. Blood Tests is/are located on the fourth floor of the Tower Wing. 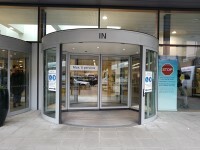 Access to Blood Tests is via the main entrance. On entering the main entrance, proceed to the end of the main foyer and turn left to the Tower Wing lifts B. 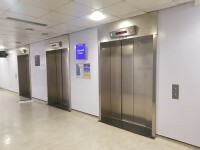 Take the lifts to the fourth floor and on exiting the lifts follow the signs for Blood Tests. Blood Tests is located on the right. 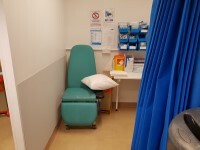 There is step free access, via lift, to Blood Tests. 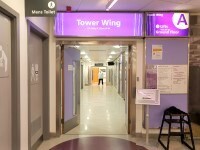 Blood Tests is approximately 9m from the Tower Wing lifts B. There is a/are manual, heavy, double door(s) between the main entrance and the department/service. 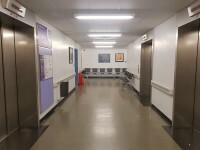 There is flooring in corridors which is shiny and could cause issues with glare or look slippery to some people. This information is for the entrance located at the front of the hospital. The main door(s) open(s) by revolving. The width of the door opening is 210cm. 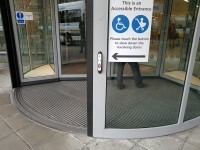 There is a touch button on the revolving doors which slows them down and makes them accessible for wheelchair users. The button is 86cm high from the floor. 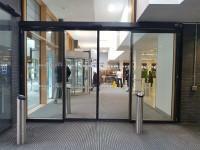 The main automatic door(s) is/are push pad activated. The width of the door opening is 196cm. The automatic door(s) is/are push pad activated. The ramp/slope is located in front of the accessible entrance. 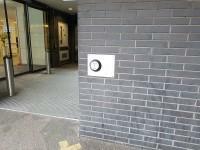 The push pad buttons to activate the automatic doors range in height from 93cm to 101cm. 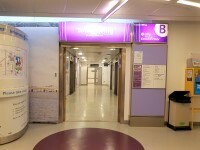 You are on Entrance (Tower Wing Entrance Lifts A and B). Skip to the next section. This information is for the entrance located in the hospital main foyer. The door(s) is/are permanently held open. The width of the door opening is 148cm. There is an entrance for both lifts, one for Tower Wing A and one for Tower Wing B. The entrance details are the same for both. You are on Other Floors (Tower Wing). Skip to the next section. 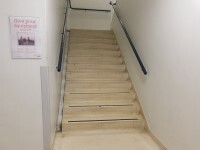 The floors which are accessible by stairs are LG - 30. 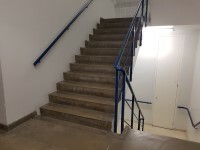 The stairs are located within the Tower Wing. 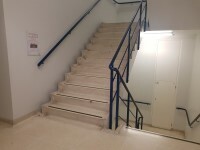 The stairs are approximately 5m from the Tower Wing entrance. You are on Lift (Tower Wing Lifts B). Skip to the next section. 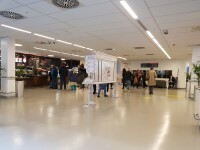 The lift is located to the left of the main foyer. The lift is approximately 16m (17yd 1ft) from the accessible entrance. 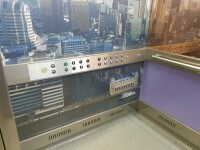 The floors which are accessible by this lift are LG,G,1,2,3,4,5,6,7,8,9,10,11,12,13,14,15,16,17,18. The clear door width is 150cm (4ft 11in). The dimensions of the lift are 229cm x 165cm (7ft 6in x 5ft 5in). You are on Waiting Room / Area. Skip to the next section. 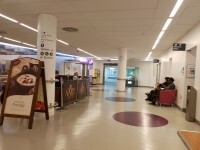 The waiting room / area is approximately 10m from the Tower Wing Lifts. 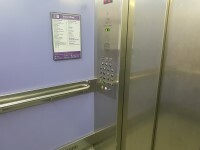 Level access is by lift. 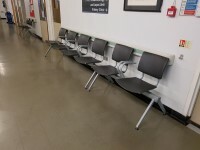 There is a space for a wheelchair user to wait within the seating area. 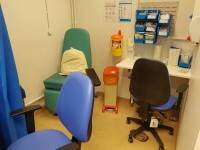 You are on Consultation / Treatment Room (Blood Tests). Skip to the next section. The name / number of the room surveyed was; Blood Tests. The door(s) open(s) by sliding. There is not room for a wheelchair user to manoeuvre. There are some chairs with armrests available. 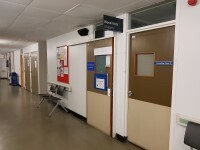 The shared toilets that were surveyed are located to the left of the Blood Tests room. 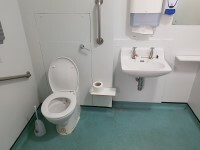 The shared toilet(s) is/are approximately 16m (17yd 1ft) from the Tower Wing lifts. Guy's Hospital- Main Building link (new tab) - click here.